It’s Christmas Eve and, as usual, Jen has waited until the last minute to complete her Christmas shopping. She also needs to refill an important prescription for her father who is visiting, especially since the pharmacy will be closed for the next few days. Jen drops off the prescription at the pharmacy and heads out to the mall next door to grab the few gifts left on her list. The stores are packed and it takes Jen forever to get through the crowds. By the time she gets back to the pharmacy it has been closed for 15 minutes and there is no one in sight. She gets out her phone to call them only to realize the “unavailable” caller she automatically sent to voicemail a while ago, was actually the pharmacy. They left a message reminding her they were closing early and that her prescription was ready to pick up. Jen had assumed it was another annoying robocall that she didn’t have time to deal with. If only she had known it was the pharmacy calling, she wouldn’t be in this situation. With consumer’s hectic lives, the last thing they want to do is stop to pick up a call when they are busy running errands. Especially if the call is from an unidentified caller. It could be a scam call or a sales rep trying to sell them something they do not want. They remember the last time that they answered an unidentified number. They were annoyed by a call from someone trying to sell them a timeshare apartment. They vowed to never let that happen again and avoid answering calls from unidentified numbers. As a local business, the pharmacy used to be a respected part of the community. But these days, with more options for consumers to order online or buy from another pharmacy, employing strategies to provide personalised service is the only way to stand out. Offering a convenient, hassle free way to inform customers of important and timely information is key to an elevated customer experience. 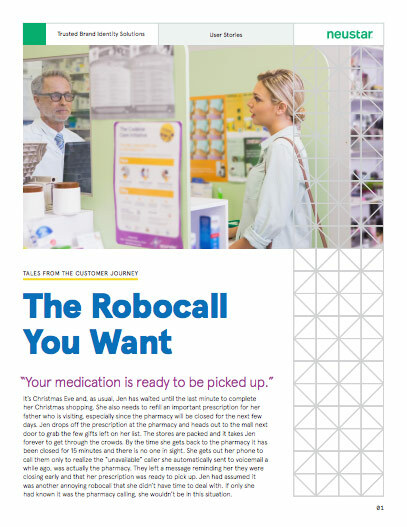 When pharmacies can deliver automated calls to customers to advise them that their prescription is ready, they improve pick up rates, reduce their cost for keeping costly inventory, and improve customer retention.